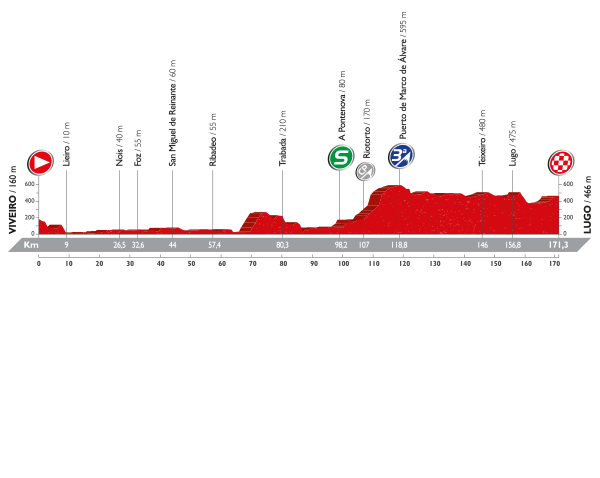 Stage 5 is a 171.3km jaunt from Viveiro to Lugo, a predominantly rolling affair which should appeal to the sprinters, and strongmen especially given that it is the closest day they will get to a flat stage ahead of the final day’s ride into Madrid. The day only includes one climb, the 11.8km Category 3 Puerto de Marco de Alvara (avg 3.6%) and should prove manageable enough for the fast men to overcome en route to the finale. The run into home is a technically demanding passage and could prove troublesome for a few of the day’s contenders, featuring an uphill drag which may blunt the top speed of some involved. Niccolo Bonifazio was unfortunate to not take the win on Stage 2 when a crash in the final kilometres caused panic amongst the peloton. Trek-Segafredo have already confirmed their intentions to guarantee a sprint finish for Bonifazio on Stage 5 and will not want to let this rare opportunity pass them by at this year’s Vuelta a España. He is strong enough to survive the late drag to the line and will be confident of being the fastest sprinter left during the run in to home. Fabio Felline will be the ideal rider to call upon for Trek-Segafredo if the finale proves to be a tougher affair than expected and thus sends teammate Bonifazio out the back door early on. Felline has recently rediscovered his form during the Tour of Poland, suggesting he may be harbouring sharper condition than many will be anticipating here. Felline is capable of joining any last gasp move in order to reduce the pressure on Trek-Segafredo to chase and is also one of the fastest puncheur styled riders likely to remain if a late move slips away from the peloton. Gianni Meersman picked up the win on Stage 2, though much of this may have been due to the chaos caused by a crash as they approached the final kilometres. His leadout train compensates a great deal for the fact that Meersman is not the fastest sprinter here, but the probability of today’s finish being tougher than expected will play into his hands perfectly. Kristian Sbaragli is another rider who often rises to the top once the typical fast men begin to fall away, as demonstrated when winning Stage 10 of this race last year. The Dimension Data rider may not have the most efficient leadout, but the strength is there, meaning he could prove tough to better if everything goes to plan for the African outfit. Dries Devenyns is no stranger to making life tough for the peloton, often striking out late in the day and forcing the sprinters’ teams to bury themselves in pursuit of the strong Belgian rider. He arrives here off the back of an impressive performance at the Tour de Wallonie which delivered him the final stage and the overall title. The assumption today is that the final 10km are likely to be a much tougher challenge than the roadbook suggests and Devenyns is a perfect candidate to make a last gasp move in pursuit of victory. Other potential sprinters and strongmen who could challenge for the win include; Magnus Cort, Nikias Arndt, Philippe Gilbert, Luis Ángel Maté and Michael Schwarzmann. Posted on August 23, 2016 by Spokenforks	This entry was posted in La Vuelta a España 2016, News and tagged 2016, Dries Devenyns, Fabio Felline, Gianni Meersman, Kristian Sbaragli, La Vuelta a España Stage 5 Preview 2016, Lugo, Luis Ángel Maté, Magnus Cort, Michael Schwarzmann, Niccolo Bonifazio, Nikias Arndt, Philippe Gilbert, Preview, Puerto de Marco de Alvara, Spokeforks, Trek-Segafredo, Viveiro. Bookmark the permalink.